Fortune, wealth and career luck shine brightly on you in 2019. You are going to enjoy a prosperous year with sporadic windfall. If you desire some breakthrough in your career, it is time to seek partnership with someone trustworthy and passionate about the same vision for good tidings. First and foremost, auspicious stars namely the Zi Wei star (Emperor) and Long De star (Dragon Virtue) will propel you upwards with success. They exert positive influences to your career and promise nobleman luck. Powerful figures will come to your aid at all times. They will neutralize negative effects brought about by petty people. Salary increment for wage earners and handsome profit for businessmen are indicated. Those who are ambitious can open up a new business or expand the existing one if you capitalize on timely opportunities. You will make it big this year because opportunities flow in naturally. Your wealth luck in terms of mainstream income and windfall will be good; therefore do not miss the golden opportunity to become the top earner. You can reap good profits in your speculative investment or in the stock market. Do not flaunt your wealth to avoid attracting robbers and thieves. On an equally good note, another good Di Jie star (Earth Relief) is excellent at transforming all turmoil into good luck. You will be unscathed even if you meet with an accident. On the downside, be mindful that the unlucky Bao Bai star (Brutal Defeat) can possibly cause you loss of wealth in a big way especially in investment. It strongly implies significant downfall. Beware of scams. Greed only leads to bad finance decisions. Furthermore, this is compounded by unlucky star Tian E (Dark Sky) star indicating possible losses and risk of accidents. This is a disaster star that summons forth sudden blows of disasters and harm. On an equally bad note, You Yi star (Emotional) will keep your motivation down. It also implies depression where you will keep harping on past sadness and anxiety where you will always worry about the future. This will affect your happiness and cause unnecessary relationship pressure. Subdue Quarrelsome Star #3 - Display the Fiery Horse by the bedside. Carry along the Chundi's Fan-Mirror to prevent disputes with others..
Elevate Career - Display the Dragon Tortoise Globe at your work desk or in your living room. 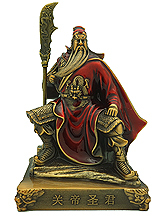 Carry in your work bag the Emperor's Robe Amulet to secure a promotion. Activate Windfall Luck - Display the Red Pearl Gold Dragon in the south. Enable Wealth Savings - Display the Fortune in your Hands in the center of your living room. Wear the Pregnant Dragon Pendant. Eliminate Accidents/Injuries - Display the Sitting Kwan Kung looking at your main door from inside out to guard your safety when you are out. Keep in your car or carry along the 8 Immortals Coin. Love and Happiness - Display the Double Happiness Mandarin Ducks in the bedroom.